You know an item is a big deal when fashion editors are proud to all wear it at the exact same time—think back to last year when the front row was a lineup of Gucci loafers or in 2013 when Mansur Gavriel bucket bags were in every editorial meeting. My latest purchase is a square basket bag from Muuñ with a striped pouch tying into a large decorative bow, and it turns out I'm not alone. Who What Wear UK's Editorial Director, Hannah Almassi, and the President of Digital at CMG, Alex Taylor, both also brought Muuñ bags to work this week, proving that the Muuñ obsession has struck both our London and our Los Angeles offices. 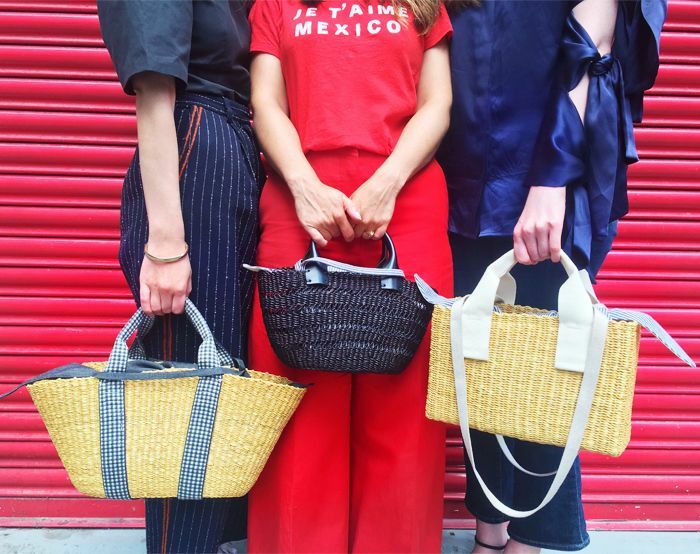 The Who What Wear editors with their Muuñ bags. They might be sold out on plenty of sites, but there are still some left for grabs on Muuñ's own site. Scroll below to shop our edit of the best Muuñ bags to buy now. Next up, see more of the best basket bags around this summer.